A tour of the old town (Altstadt) part of Oberursel is being offered on Saturday, 2nd June 2018 at 2pm. A tour of the old town (Altstadt) part of Oberursel is being offered on Saturday, 5th May 2018 at 2pm. 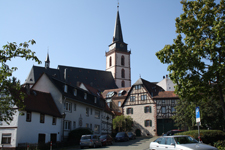 A tour of the old town (Altstadt) part of Oberursel is being offered on Saturday, 7th April 2018 at 2pm. A tour of the old town (Altstadt) part of Oberursel is being offered on Saturday, 3rd March, 2018 at 2pm.